(Nanowerk Spotlight) Our Spotlight today again shows an example of the very fundamental research that is taking place in labs around the world to lay the foundation for future nanotechnology based devices. It illustrates the very early stage of development and the nature of the fundamental challenges that make up today's 'nanotechnology research. The vision of revolutionary bottom-up nanotechnology is based on a concept of molecular assembly technologies where nanoscale materials and structures self-assemble to microscale structures and finally to macroscopic devices and products. Researchers are a long, long way from realizing this vision but they are busily laying the foundation for nanoscale engineering. Assembling nanoscopic components into macroscopic materials is an appealing goal but one of the enormous difficulties lies in bridging approximately six orders of magnitude that separate the nanoscale from the macroscopic world. Right now, nanotechnology researchers have their hands full just learning how to control a straight chain of nanoparticles. Scientists have developed various techniques to organize nanoparticles into ordered architectures – a prerequisite for being able to build structures that exploit their intriguing properties. Most assembly routes require a substrate, liquid solution or the use of a sacrificial metal. Researchers in Germany now have demonstrated a more general and fairly simple assembly method for the synthesis of various metal nanoparticle chains embedded in nanotubes with tunable particle sizes and spacings. This method is applicable for a wide range of metals and tube materials. This opens the possibility to prepare various embedded nanoparticle chains with tunable optical, electric, and magnetic properties. "It has been a challenge to put nanoparticles of defined sizes and distances inside a nanotube" Dr. Yong Qin tells Nanowerk. "In our approach, the nanoparticle chains are obtained by annealing metal nanowires confined in nanotubes with an additional defined free volume around the nanowires. The basic phenomena take advantage of the so-called Rayleigh instability which is the transformation of a wire into a string of spheres of this material by a proper heat treatment." Qin, a researcher at the Max Planck Institute of Microstructure Physics in Halle, Germany, explains that this allows a reduction in the total surface energy of the system and is the same effect as the breaking up of a water jet from a faucet into individual water droplets. "The transformation of the wire to the particles requires free space around the wire" he says. "In our approach, the transformation happens within a nanotube which allows us to control the free volume available for the transformation." 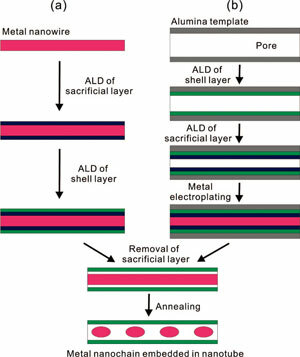 Beginning with metal nanowires from arbitrary synthesis methods, the Max-Planck team applied atomic layer deposition (ALD) to coat the nanowires first with a sacrificial layer then with a shell layer. 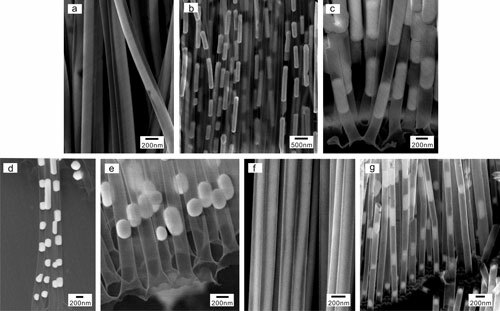 By then removing the sacrificial layer they obtained confined wires in nanotubes with a free volume. In a final step, embedded nanoparticle chains were produced inducing the Rayleigh instability by annealing the confined nanowires. Through the amount of free volume supplied around the nanowires – the critical issue is to create sufficient free space in the nanotubes for Rayleigh instability to occur during subsequent annealing – the researchers are able to control whether the wire transforms into chains of spherical metal nanoparticles or into chains of just cylindrical metal nanoparticles. Qin is the first author of a paper in the September 10, 2008 online edition of Nano Letters that describes these findings ("General Assembly Method for Linear Metal Nanoparticle Chains Embedded in Nanotubes"). He is part of a group at the Institute, led by Professor Ulrich Gösele, that pushes the limits of nanoscience and nanotechnology. Their basic research is focused on the scientific understanding, design and fabrication of new materials for information, communication, engineering as well as bio-technological applications. The team's capabilities include methods to fabricate nanocrystallites, nanowires and nanotubes, as well as micro- and nanoporous structures for a great variety of materials, including semiconductors, ferroelectrics and composites. In a previous Spotlight (Biomolecules as novel templates for the fabrication of nanostructures) we have introduced another group member, Dr. Mato Knez, and his work on using ALD for thin film deposition on nanostructures. The novelty of the current work is that the morphology (spheres or cylindrical particles) of the particles as well as their diameter and spacing can be tuned by controlling the free volume available inside the tube. This has not been possible before. This method is quite general not only for different metals but also for different tube shell materials given the available wide range of materials which can be deposited by ALD. Qin cautions that there are several challenges to overcome before their method could be applied to the fabrication of metamaterials with designed special optical properties: The interspacing of the nanoparticles is over 10 nm generally, which exceeds the value for plasmon waveguide. Also, presently, the alignment of the nanoparticles from tube to tube is not coherent and not yet ready for applications requiring long-range order in all directions.